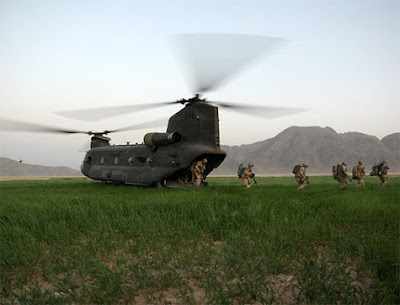 In this March 26, 2010 photo, Canadian soldiers pour out of the back of a Chinook helicopter as part of a sweep of villages southwest of Kandahar City, in Khenjakak, Afghanistan. Reminds me of really big stars and shoes and counts..
And to think I real more than a thousand pages of "Future Shock" for naught. So, I reckon this 'war's' 'bout poppies? He should have retired and so should have Peloski...near "Ten Years After" tomorrow land it seems to me. ...wish they would retire, what 'on this pale blue dot' makes tham keep ticking? Must be all that great "HealthCare." EGO, ERGo, dirt that has not realized 'their con-science' yet? Perhaps 'Type A' Personality Disorder? So afraid to lose, they ain't got no wings, no prayers, nothin' but great educations.